So few crafters can “just craft” for a living; they’re usually “making a living” and crafting on the side. This often means there’s precious little time to actually sit down and craft. The solution I’ve found is taking my projects with me if I know I’ll be sitting in a waiting room for more than five minutes or have a half hour or so to kill between activities while I’m out and about. Behold! My mobile crafting unit! It’s just a file box you can pick up at any old office supply store and I tied a string around the back of the lid so I can slide a clipboard down the back – as it’s juuuust too big to fit in the box. Now I certainly could have gone with a fabric tote bag, but I wanted something more rigid and durable, that wouldn’t flop over onto my neighbor’s feet in the doctor’s office waiting room. 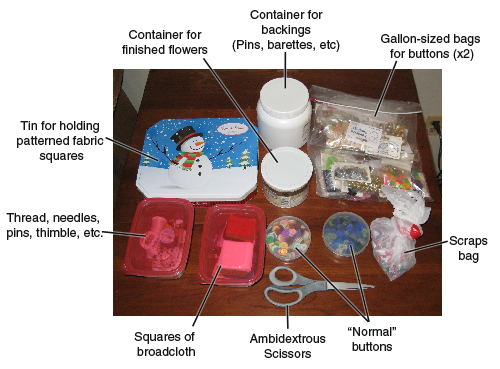 This shot is all the contents of the box spread out and labeled. 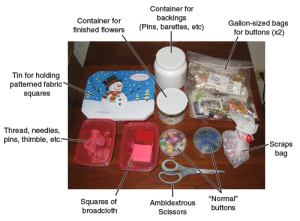 Reusable plastic containers are wonderful in this setting as they keep all the parts and pieces needed to get some crafting done. In this case, everything you see here relates to flower-making. Tins that once held chocolate (they’re rather ubiquitous during the Christmas season) repurpose nicely for keeping the little squares of fabric we use contained and organized. Sam and I have found that instead of keeping the buttons we use for the centers of flowers on the cards they came on, it’s far more convenient to pull them all off (as we tend to buy cards of buttons in sizable quantities) and stuff them into their own smaller zip-lock baggies along with just one card for ease of identification when it’s time to buy more. 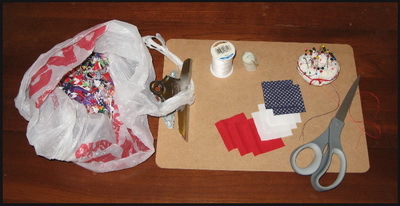 You can get this type of small bag from any craft store or just use snack-sized bags from the grocery store. I personally separate out my buttons into two large gallon-sized bags: one is for “normal” buttons and the other is for the more decorative and less used buttons. All set up and ready to craft. Keeping a scrap bag with you while crafting away from home is essential to not leaving a mess behind and not having to worry about where to find a damned trash can! The clipboard is my working surface if I can’t get near a table. Fortunately petal-folding doesn’t require a great deal of space and the clip works great for keeping the scrap bag in place! Another nice thing about this setup is you can put it all away fairly quickly. Worse comes to worse you can dump the contents of the clipboard back into the box, snap the lid shut and slip the clipboard back in place in just a few seconds. Hope you found this informative and useful!